Case Play 2 features a Battle of the Broadcasters, pitting Jon Miller (SF Giants) against Bill Schroeder (MIL Brewers) in a rules book showdown from the Brewers' walk-off win on April 17, 2013. This Case Play remains open (reply to this post; include your username) through Sunday, April 21 at 11:59 PM Pacific Time. Each question ("a", "b", "c") is worth one point; posts will remain in moderation until Monday. This is a UEFL Video Case Play. Click the picture to view. Play: With one out and a runner on first in the bottom of the ninth inning of a tied ballgame, batter B1 hits a ground ball into the hole between short and third base. Shortstop F6 fields the ground ball and, after R1 has already rounded second base, throws wildly past first base and into the dugout or camera well. a: Milwaukee's Bill Schroeder and San Francisco's Jon Miller both had unique interpretations of the play as it unfolded and as Brewers Manager Ron Roenicke came out to discuss the events with home plate umpire and crew chief Tim Welke. Bill Schroeder (Milwaukee Brewers, FSWI): "It's not where he was when the ball goes into the dugout, it's where the fielder gets rid of the baseball...he should be able to score." Jon Miller (San Francisco Giants, KNBR): "That rule is simply from the base at which they started [on a batted ball, at time of pitch], so he only gets the one extra base no matter where he actually was." Who is right: Schroeder, Miller or neither? If neither, what would a fully correct transcript have stated? For this and the following scenarios, where do the runners end up and how shall play resume? b: Assume F6 Brandon Crawford bobbles the ball—does not field it cleanly—and fakes R1 Josh Prince back to second before throwing to first base, with the same result of a wild throw into dead ball territory (had the throw been accurate, B1 Carlos Gomez may or may not have been retired—it would have been bang-bang at first). Is your answer to part (a) the same? If not, what is the correct ruling? c: Assume F6 fields the ball cleanly, as in the original play, but the speedy Carlos Gomez had already rounded first base in anticipation of a potential error as Crawford releases his throw in an attempt to "pick off" or catch Gomez by surprise in throwing behind the batter-runner. R2 Prince is standing on second base. As in the original play, this throw enters DBT. Is your answer to part (a) the same? If not, what is the correct ruling? A) the award would be two bases from the time of the pitch on the first play made from the infield UNLESS the runner has obtained the next base before the fielder releases the ball. C) is the same as A with the exception that Gomez (the Batter-Runner) would be awarded 3rd since he had obtained first before Crawford released the ball. Also, as a Giants fan this doesnt make me happy, the Brewers announcer is more correct then the Giants broadcaster. First play by an infielder, two bases time of pitch unless all runners have obtained advance base at time of throw. I agree with Arik Goldsmit on all 3 answers. Speaking as a brewer fan Bill schroeder screws up rules all the time. He thinks he knows everything because he was a back up catcher in the 80s. He is a horrible announcer but Brian Anderson makes up for it most of the time. Do we get points for case plays this year or are they just for fun? If we do get points let me know if I have to be more clear on my answer. Yes, one point per lettered question ("a" "b" and "c" here). 7.05g states ...When such wild throw is the first play by an infielder, the umpire, in awarding such bases, shall be governed by the position of the runners at the time the ball was pitched; in all other cases the umpire shall be governed by the position of the runners at the time the wild throw was made. Therefore, A would be Two bases, with Miller being correct. B would also be the same. However, according to the Approved Ruling with 7.05g-If all runners, including the batter-runner, have advanced at least one base when an infielder makes a wild throw on the first play after the pitch, the award shall be governed by the position of the runners when the wild throw was made. So, C should put R1 home, and the BR on 3rd. a) Because the batter had not passed first base, all runners only advance two bases from the time the pitch was made. If an outfielder had made the throw, the R1 would have scored and the game would be over (since, from my understanding of the video clip, it would have been the winning run.) If an outfielder had somehow made a throw in the same situation (though why he'd throw to first there is beyond me) except that the run would not have ended the game, the batter-runner would be put to second base. b) Same as a, since the BR did not touch first before the throw was made. c) Since all runners have advanced one base, it is now two bases from that base. The runner originally on first scores, and (from my understanding of the clip), the game is over and Milwaukee wins. If it were not a game-winning error (I refuse to use the phrase "walk-off error") and the game were continuing, the BR would be on third. a. This was a correct ruling by Welke and crew. Schroeder was definitely more right than Miller (who wasn't even close because he is an idiot). Awards are determined when the fielder actually releases the ball. Schroeder didn't know to explain the situations if it should be "time of pitch" or "time of throw". b. The rulebook isn't clear whether or not the fake throw is considered part of the play, or a completely different play. I would judge it to be a different play, and therefore, would have scored R2 and given Gomez 2nd base. c. In this case, because all runners advanced one base, including the batter, the award is determined by the position of the runners at the time of the throw. Score Prince and give Gomez 3rd. The notes of 7.05 (g) support this decision. Responses will remain in moderation ("screened") until Monday. Each lettered question ("a" "b" "c") is worth one point; for each, state where the runners end up and how play shall resume. (a) Neither is really correct. It's the first play by an infielder, so it's 2 bases from the TOP unless all runners (including the batter-runner) have obtained one base. The batter-runner didn't, so R1 is awarded third and the BR is awarded second. (b) A fake is not a play. So the result is the same because the throw to first is still the first play by an infielder. (c) No, not the same because all runners (including the batter-runner) would have obtained one base by the time of the first play by the infielder -- that makes it a time of throw award. Score R1 (now at second) and award the BR third. a) Jon Miller is correct, the first play by an infielder is two bases from the time of the pitch. A. Neither. If on an initial throw the ball goes into a dead ball area, the BR and any additional runners are awarded two bases from where they were at the time of the pitch. C. No. Two bases from the time of the throw. A. In this scenario, I believe that neither broadcaster got the ruling completely correct. Miller was the closest to getting the correct ruling, but did not have the correct explanation. The correct explanation should be based on Rule 7.05 (g). This rule states that: “Each runner including the batter-runner may, without liability to be put out, advance—Two bases when, with no spectators on the playing field, a thrown ball goes into the stands, or into a bench (whether or not the ball rebounds into the field), or over or under or through a field fence, or on a slanting part of the screen above the backstop, or remains in the meshes of a wire screen protecting spectators. The ball is dead. When such wild throw is the first play by an infielder, the umpire, in awarding such bases, shall be governed by the position of the runners at the time the ball was pitched; in all other cases the umpire shall be governed by the position of the runners at the time the wild throw was made.” Therefore, since this was the first play by an infielder the runners were ruled at the correct position with R1 being placed at third base and B1 place at second base. Play would continue to the next batter and the game would continue until a winner can be determined. C. This scenario would have a different awarding of bases. Based on the “APPROVED RULING” for Rule 7.05(g): “If all runners, including the batter-runner, have advanced at least one base when an infielder makes a wild throw on the first play after the pitch, the award shall be governed by the position of the runners when the wild throw was made,” the runners would be placed at different bases. In this scenario, the runners would be awarded bases based on the time of throw. Therefore, B1 would be awarded third based and R2 would be awarded home. In this scenario, the game would be over and Milwaukee would win the game. a. The throw was the first play made by F6. R1 goes to third base, B1 goes to second base. b. The throw was not the first play made by F6. R1 scores, B1 goes to second base. The game is over. c. Same ruling as in part a. B) Same, because it is still the first throw by an infielder. C) Here, the award is 2 bases from the time of the throw, as each runner (including the BR) has already advanced at least one base (7.05g Approved Ruling). Therefore, R1 would score, BR would get 3rd. a) Surprise, surprise, none of the announcers got it right. The correct transcript would have been "First play or attempted play by an infielder means two bases at the time of the pitch." Schroeder would have been right if the play would have been the second by an infielder or any play by the outfielder and Miller must have talked to some Little League umpires. b) No, this time, the award would have been made at the time of the throw - the fake to second constitutes the first play or attempted play and the wild throw is the second play. R1 scores and if the BR had not touched 1st at the time of the throw, he would be awarded 2nd. c) Assuming R1 has advanced to 2nd, the award would be made at the time of the throw. If all runners, including the BR advance at least one base, the award is made from the time of the throw. R1 scores and the BR would be awarded 3rd. By the way, love the use of the Inspector Gadget music in the video. A) Neither is correct. It is the first play by an infielder and the batter-runner did not yet reach 1st base. It is 2 bases at the time of the pitch. Runners at 2nd and 3rd with 1 out. B) It is the 2nd play by an infielder so it would be 2 bases at the time of the throw. Since the batter runner was not at 1st base yet it would be runners at 2nd and 3rd with 1 out. C) It would still be 2 bases at the time of the pitch. However since the batter-runner has already made it to 1st base at the time of the throw it would be 2 bases from there. So it would of been R1 scoring with the batter runner at 3rd and the brewers winning just like they did anyway! majessa: a) Neither if fully correct. If all runners, including B/R have advanced 1 base before the throw on the 1st play by an IF'er, then award is 2 bases from time of throw. If not all runners incl. B/R have advanced 1 base, then its 2 from TOP. b) If F6 fakes a throw, then throws to F3 wildly, the award is 2 bases from time of throw for all runners. c) Same rule applies as in "a." This is the first play by an IF and all runners have advanced 1 base so the penalty is 2 bases from Time of Throw. In A) Neither is fully correct (shocking). This is a case of the first play by an infielder, OBR Rule 7.05g, comment, approved ruling states, "The term 'When the wild throw was made' means when the throw actually left the players hand". The rule goes on to say, "if the batter-runner had not reached first base, the award is two bases at the time the pitch was made for ALL runners" (emphasis added). In senario B) the answer is the same as in A), the key word being FAKES. A fake is not an actual play or attempted play. In C) The answer is not the same as in A). The runner who started on 1st is awarded home and the batter-runner is awarded 3rd base. Rule 7.05 g, play says "(...only if batter-runner is past first base when throw is made is he awarded third base)". b. Same outcome. A fake does not constitute a "play" being made on a runner. So it is still the first play by an infielder. Two bases, time of pitch. c. Two bases time of throw. The exception applies when the BR reaches 1st base prior to the first play by an infielder. So R2 scores and BR goes to third. The correct transcript would have included the wording from 7.05g "When such wild throw is the first play by an infielder, the umpire, in awarding such bases, shall be governed by the position of the runners at the time the ball was pitched,"
Play resumes with runners at 2nd & 3rd. b. A fake is not considered a play, so the wild throw is still the first "play" by the infielder. Per the MLBUM - a Play or Attempted play is a legitimate effort by a defensive player with posession of the ball to actually retire a runner. Not a Play or Attempted Play: (1) a fake or feint to a base but not actually throwing; also (4) Ruling covers a play similar to scenario "b" which states a feint to home and wild throw to 1st is still the first play by an infielder. My answer for scenario "a" remains the same. Play resumes with runners on 2nd & 3rd. c. In this scenario, 7.05g APPROVED RULING governs: "APPROVED RULING: If all runners, including the batter-runner, have advanced at least one base when an infielder makes a wild throw on the first play after the pitch, the award shall be governed by the position of the runners when the wild throw was made." All runners, including the batter-runner, had advanced one base. Therefore, the award is from the time of throw. Prince scores, Gomez awarded 3rd base. Not that it's an answer or anything, but if you gave this play to Vin Scully, he'd get it right the first time. a. Both are wrong, although Miller's closer. Because it was the first play by an infielder, the two base award is based on where the players were at the time of pitch. R1 gets 3rd, B1 get's 2nd. b. The fake to second is considered a play. As a result, the ball going out of play would be a two-base award from where the runners were located at the time of the throw. R1 scores, B1 at 2nd. c. As the batter has already reached first base prior to the throw, the two base award would be from the time of throw. R1 scores, B1 at 3rd. a.) Jon Miller Its from time of pitch b.) Since f-6 made a fake too 2nd that's considered a play the overthrow is the 2nd play by the infielder R-1 will get home an B-2 gets 2nd base..
a) The runners should be placed at 2nd and 3rd. Since the throw by F6 was the first action of an infielder after a batted ball, the base awards are governed by the runners' locations at the time the ball was pitched (Rule 7.05 (g)). Neither is fully correct, per 7.05(G). Miller is correct when he states “from the base at which they started” but is incorrect on the jurisdiction of the play. R1 is awarded third base, while BR is awarded second base. second action. This would invoke the action of runners being awarded bases from the time of the throw. Two bases are awarded; in this scenario, R1 is located on second base, and would be granted the ability to score. The BR would be granted second base. Because BR had already obtained first base, under 7.05(PLAY) R1 at second is granted home on the overthrow. Considering the BR had already obtained first base, he would be awarded third base. a) I'm a rookie at this, but in the rules it states this "Since no runner, when the ball is dead, may advance beyond the base to which he is entitled, the runner originally on first base goes to third base and the batter is held at second. So technically neither was correct. When the ball goes into the dugout and is "dead" the runners appear to be placed correctly. b) My answer would be the same because the runner is standing on second (or at least hypothetically) and therefore he would advance to the base he was entitled, third base. c) I'm not seeing a whole lot of difference between your B and C scenarios. Prince would be standing on second base in both scenarios (well hypothetically in scenario B), therefore would be awarded third and B1, awarded second base. Again, I'm a little bit of a rookie in interpreting the rules section of MLB, but that's how I would see it. If the ball is thrown out of play from a fielder, everyone gets two bases FROM THE TIME OF THE PITCH. A. I both commentators were both correct as well as incorrect. The transcript might read as follows. Brandon Crawford short stop fields the ball and on the throw to first over throws the first baseman. In this exchange according to rule 7.05 g allows that if the fielder Crawford over throws a ball and cast it into the stands on his first plan right after the ball is hit, the base runner is only entitled to two bases from where he was at when the ball hit by the batter runner. As for B and C I believe 7.05 g still applies, and it is still the same type of transcript. A) Neither broadcaster is explicitly correct. While R1 had advanced his one base, the BR had not yet satisfied the conditions to apply 7.05g's Approved Ruling. Revert to the standard award for an infielder's fist play and advance each runner two bases from time of the pitch. R1 to 3B, BR to 2B. C) 7.05g AR referenced above would apply here, as each runner including the BR has advanced one base at the time of the throw. Even though this is Play 1 by an infielder, base awards revert, per the AR, to time of throw. R1 scores, BR to 3B. (a) Neither are correct. Baserunners are entitled to 2 bases from the time of pitch if the errant throw was the first play on the ball. The Batter-Runner would be awarded 2nd and the baserunner on 1st would be awarded 3rd. (b) Since F6 initially tried to fake the runner back to 2nd, that is considered a play. 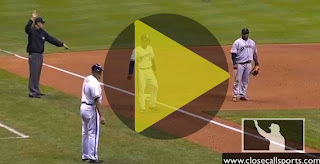 Now the base runners are entitled to 2 bases from the time of the throw since the throw to first would be the 2nd play. The base runner from 1st had already attained 2nd so he would be awarded home and since the batter runner had not yet attained 1st on the time of throw, he would be award 2nd. (c) My answer remains the same from part (a). Since F6 fielded the ball cleanly and threw the ball to first (making it the first play) both the batter runner and the base runner would be awarded 2 bases from time of pitch, which would be runners now on 2nd and 3rd. A) B1 awarded 3rd, B/R/ awarded 2nd. This was the first play by an infielder., All runners and b/r ahsll be awarded two bases from the base they occupied at the time of the pitch. B) R1 would score because the throw was not the first play by an infielder and R1 had advanced to 2nd at the time of the throw. B/R would be awarded 2nd as he had not reached first when the throw was made. C) Same as "A" B1 awarded 3rd and B/R awarded 2nd. The b/r can't be awarded third because it is already occupied. It is the first play by an infielder, the award is two bases from where the runners were at the time of the pitch. a) neither is correct, R1 is awarded 3rd base and the batter-runner is awarded 2nd base. b) R1 is awarded home and the batter-runner is awarded 2nd base. The feint to retire R1 at second is considered at play and the award is now the time of throw, so since R1 had passed 2nd base, he would score and since they were making the throw to retire the batter-runner at 1st base, he would only get 2nd base, because his last base touched at the time of the throw was home. c) R1 is awarded 3rd base (just like A) because it is the first throw by an infielder at the time of the pitch. b) 7.05(g) Comment-Approved Ruling indicates awards on an overthrow are determined by the batter-runner's position at the time of the throw. If the B-R has not yet reached 1B, the award is two bases from the time of the pitch for all runners. Therefore, the result is the same as (a), runners on 2nd & 3rd. c) Since all runners including the B-R had reached the next base at the time of the throw, the award will be based on runners' positions at the time of the throw. Therefore, the B-R is awarded 3B and R1 is awarded home. The runners are awarded two bases at the time of the pitch on the first play by an infielder. This call is correct. In scenario (b) while the bobble has no effect, the fake may have and in the umpire judgement if the fake is considered a play then that is considered the first play and the throw to DBT would be at the time of the throw thus awarding runners the bases at that time - home and second. in scenario (c) if both the BR and runner on base achieve a base prior ro the release then they are awarded two bases at the time of the throw - home nad third.